World of Pirates » Blog Archive » Your very own NPC! Be a legend in World of Pirates! Your name will live on forever in World of Pirates with the purchase of your own NPC (Non Player Controlled Character.) You will not have any control over him/her but he/she will sail the map at random and you'll also discover specialists with your name! They will last as long as the game is alive. Allow up to 10 days for creation and activation. The server must be re-set for your NPC to come to life. The Great Christmas Treasure Hunt! Never give anyone you meet on the internet or in World of Pirates your personal information! 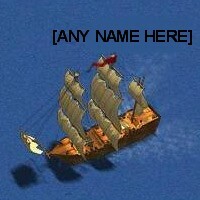 World of Pirates does not allow it’s players to share their actual names and or addresses. Please stay safe and keep your personal information to yourself.